Your impressions of the districts of Providencia, Las Condes and Vitacura will largely depend on the expectations you’ve built around your Chilean experience. If it’s earthy authenticity you’re craving for, it wouldn’t be surprising if you end up resenting this side of town. Yet for much that the eastern suburbs – or Santiago Oriente as commonly referred to – lack the charisma of the more traditional barrios, it’s hard to deny that these up-and-coming areas represent (perhaps to a higher degree than most visitors would like to admit) the true aspirations of modern Chile. The shape of things to come at Galería Animal, Vitacura. Sure, much in the east side is about shameless consumerism, self-awareness and individualism. But this area is also where Santiago gets greener, more cutting edge and in many ways more alluring. You shouldn’t dismiss it on grounds of superficiality either; this is the one place in the capital where you’re likely to catch the glimpse of a Picasso, a Paul Klee or a Damien Hirst (and be able to purchase it). It’s also got the sexiest bars, the coolest clubs and the priciest restaurants you’ll find in this corner of the globe. All in all, Santiago Oriente may well afford more time than you ever imagined. The centremost of all the three districts is Providencia, stretching from the unfathomable Plaza Italia along Avenida Providencia. The district’s commercial heartland is contained between Avenidas Providencia and 11 de Septiembre and has been the capital’s favourite shopping area for decades. Providencia has got little in the way of architectural highlights, although Avenida Pedro de Valdivia, which bisects the district from north to south, is a notably handsome cobbled road, shaded by plane trees and boasting a number of elegant mansions dating back to early 20th century. Just outside Pedro de Valdivia Metro Station lies the Casa Schacht, a former mansion belonging to the Dussaillant family and now housing the art centre of the local municipality. Another impressive Tuscan-style villa is the Palacio Falabella, at number 963, once the property of the Italian businessman responsible for the Falabella department stores in 1889, now one of the largest retail chains of the continent. The northern stretch of Avenida Pedro de Valdivia also warrants attention. The small section between Avenida Providencia and Avenida Andrés Bello (Costanera) is a small oasis of calm amidst the area’s winding traffic. Here you’ll find a range of laid-back cafés, such as el Cafetto and some popular restaurants like the vegetarian-friendly El Huerto or the bubbly Liguria. Try also venturing across the river to the leafy stripe of land tucked between the riverside and the Cerro San Cristóbal. 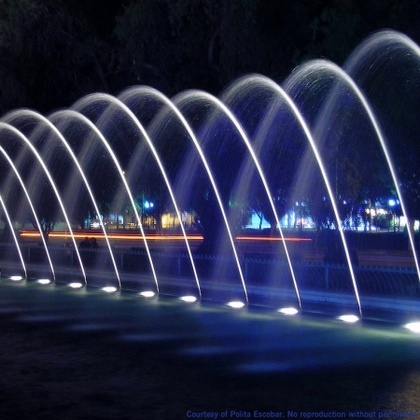 Along the banks of the Mapocho and spreading eastwards is the superb Parque de las Esculturas, an open-air display of contemporary Chilean sculpture which few people seem to take advantage of, despite the fact that it enjoys commanding views of the city’s skyline. Head towards the junction of Costanera, Avenida Vitacura, Avenida Isidora Goyenechea and Avenida el Bosque, to find yourself at the starting point of Barrio el Golf and the greater district of Las Condes, the most upmarket of Santiago’s suburbs. This irreproachably stylish quarter boasts an architectural blend of old maisonettes dwarfed by mirror-glassed skyscrapers. Although many architectural follies have a home in this relatively small area of land, the cityscape of el Golf will one way or another find its way to your heart. It certainly helps that at least at the ground level, the boulevards are wide, the traffic excludes noisy buses and most restaurants cafés have al fresco seating areas. This is also a place for great food – for inspirational dining try Coco Loco – specialising in seafood – or the corny but honest Pinpilinpausha, a local institution serving great Chilean-Basque food for over 70 years. For wine tasting, you’ve got two outstanding options, the budget-blowing Wine 365 at the Ritz Carlton (just outside El Golf Metro Station) offering a different Chilean wine every day of the year or alternatively, the Miguel Torres Tapas Bar, an excellent chance to taste not-for-export produce in a hip, lively environment. For an inexpensive lunch or dinner, try the Fast Good restaurant on Isidora Goyenechea, a project by Catalan chef extraordinaire Ferran Adriá, serving straightforward, uncomplicated food.. Shame for the Ikea furniture, though. 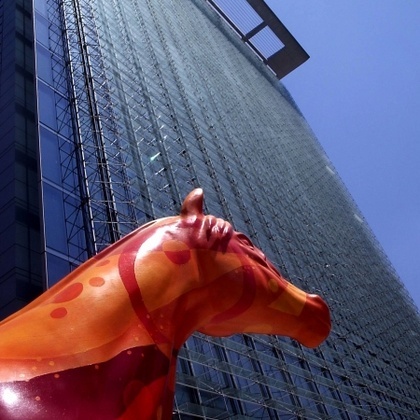 Galloping into the future: high rise architecture in Las Condes. Your next stop should be Vitacura, and more specifically, the vicinity of Nueva Costanera, which can be reached either by bus or, preferably, on foot. This pretty, commodious area of young show-offs, sports cars and chichi boutiques is the playground of Santiago’s moneyed population. For designer shopping, make a turn into Avenida Alonso de Córdova where you’ll find a parade of labels like Louis Vuitton, Armani and Hermès. Art dealing is another of the area’s strengths, with several galleries stocking the best price-tagged modern and fine art in the city, among those Marlborough Fine Art (Galería A.M.S. Marlborough), Galería Isabel Aninat and Galería Animal. The latter is also home to an important permanent exhibit of paintings by Chileans Roberto Matta and Gonzalo Cienfuegos, as well as a busy calendar of annual events. The zeitgeist of the area has also recently been bolstered by the unveiling of Santiago’s newest museum, the Museo de la Moda, dedicated to fashion history and showcasing objects from Ancient Egyptian beauty accessories to haut couture pieces by Gaultier and Dior. The district has also made a great contribution to the capital’s cuisine, with a selection of great restaurants such as the lusciously unpretentious Puerto Fuy on Nueva Costanera or the carnivore-heaven that goes by the name of Ox, just across the road. If you shoot off along Avenida Luis Pasteur, which runs almost as far as the south bank of the Mapocho river, you’ll find restaurants and bars galore at the Borde Río, a development huddled between Avenida Monseñor Escrivá de Balaguer and the river. Don’t be suspicious of the inauthentic look of the complex, some of the restaurants here are very decent indeed, particularly the popular Zanzibar, the Lamu Lounge or the Sakura, all serving exotic fusions of local produce and international techniques, and all crammed with hipsters on weekend nights.